The year 2019 is expected to open up a watershed moment for the denuclearization and peace cooperation on the Korean Peninsula. President Moon Jae-in’s New Year news conference, North Korean leader Kim Jong-un’s New Year message and exchanges of “warm” letters between U.S. and North Korean leaders are evidences that a new era of hope and opportunity is emerging. 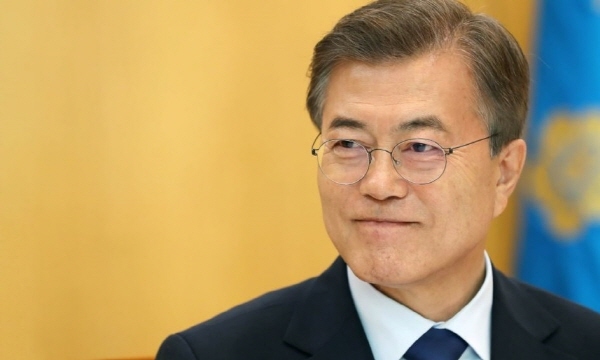 President Moon Jae-in. He is considered the most open-minded President of Korea in terms of improving relations and cooperation with North Korea. Given the circumstance, the government should go the extra mile to unite national consensus by collecting a wide range of public opinions. The Korea Post obtained the "2019 North Korea Policy Proposal,” which was produced by the non-profit corporation, Unification Council of Korea, and publish a summary. Unification Council of Korea Chairman Koo Bon-tae (former Unification Policy Chief) and former Vice Unification Ministers Um Jong-sik and Kim Hyung-seok participated in the writing of the 48-page report, along with former unification officials including Jeon Gyeong-man, Ko Sung-ho and Park Young-ho. The following is a summary of the “2019 North Korea Policy Proposal: ”Above all, it is necessary to formulate policy options to open an era of denuclearization, peace and cooperation on the Korean Peninsula by keeping inter-Korean relations on a solid footing through faithful implementation of the agreements of the 4.27 Panmunjom Declaration and the 9.19 Pyongyang Joint Declaration. Furthermore, it is necessary to find a breakthrough for the stalled denuclearization talks between the United States and North Korea and the improved inter-Korea relations. Chairman Kim Jung-Un of North Korea. Chairman Kim appears to be among the most forward-looking in terms of improving relations with the Republic of Korea (south). All the same, he is not viewed as being as widely open as is desired by the Republic of Korea and the rest of the Free World countries. In order to find valuable policy options, we need to set several prerequisites. (1) The international community must continue its efforts to impose sanctions and increase pressure on North Korea in order to fully denuclearize the Korean Peninsula. It should be noted that the global community's sanctions against North Korea have proved effective in halting the North’s provocations of nuclear and missile tests and its coming to the dialogue table over the past year. (2) For the purpose of materializing the complete denuclearization on the Korean Peninsula at an early date, new incentives are needed to give an impetus to denuclearization, in addition to economic sanctions. One option is to develop inter-Korean cooperation in various aspects, such as political, diplomatic, economic and military. 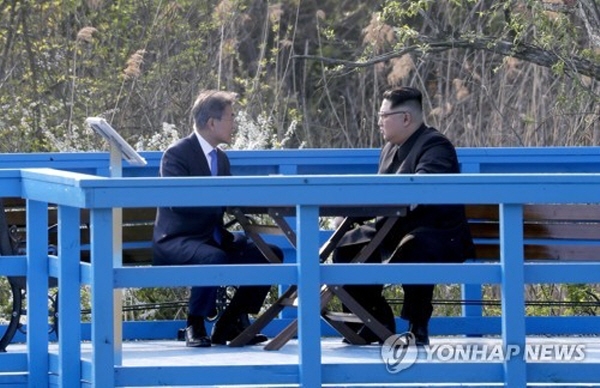 President Moon (left) and Chairman Kim have a two-man talks on the Dorodari Footbridge near Panmunjom straddling between the two Koreas. Moon is eager to improve relations with the North, but Kim seems to have drawbacks as he has many people in the North Korea whom he has to persuade. - Seoul and Pyongyang should sign a South-North Basic Agreement which will serve to supplement and advance existing agreements including the 1992 inter-Korean Basic Agreement. Based on the premise that "one national community, two government systems shall work together and co-exist toward unification," the proposed agreement should declare the end of the war as an interim measure to turn the current armistice into a peace regime. - The South and the North should faithfully implement the 9.19 South-North Korean military agreements for the purpose of easing military tensions and preserving the armistice system. This is important as heightened tension on the Korean Peninsula will likely make the two Koreas heavily dependent on the U.S. and China. We also need to address concerns that the two Koreas could be swayed by the interests of the U.S. and China in negotiations to resolve the Korean issues. 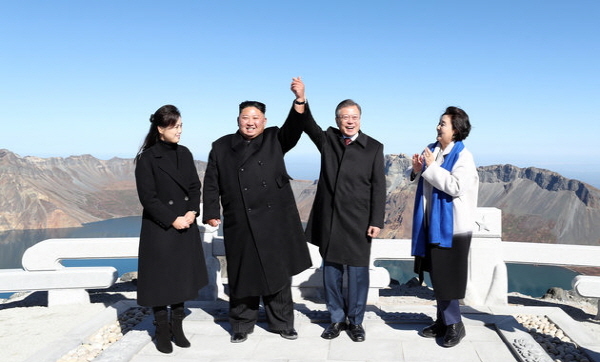 President Moon and his North Korean counterpart, Chairman Kim Jong-Un, firmly grabs hands with each other, and raise them high with their spouses, First Lady Kim Jung-sook, on the right and her North Korean counterpart, Madam Lee Sul-joo. Based on the premise that it is not an obstacle to sanctions against Pyongyang in economic terms, Seoul should explore ways to strengthen economic cooperation with North Korea. Above all, it is urgent to devise complementary, balanced and peaceful policy options to address the North Korean nuclear issue, establish a lasting peace regime and enhance inter-Korean relations, which are critical for the realization of peace and prosperity policy on the Korean Peninsula. Inter-Korean cooperation should not be an obstacle to denuclearization, and keeping the sanctions against North Korea is necessary for the complete denuclearization of the Korean Peninsula, but sanctions and pressures on the North should neither threaten North Koreans’ right to survive nor hamper improvements in inter-Korean relations. While pursuing policy alternatives to secure the sincerity of North Korea's denuclearization and implement them, the South needs to implement policy options including incentives to speed up denuclearization through inter-Korean cooperation. Chairman Koo Bon-tae of the Unification Council of Korea (right) is interviewed by Vice Chairperson Cho Kyung-hee of The Korea Post media, publisher of 3 English and 2 Korean media outlets since 1985. Between them are the publications put out by The Korea Post celebrating the 34th anniversary this year. In any case, humanitarian aid and related measures should be preserved and strengthened. As sanctions against North Korea are escalated, humanitarian aid toward the North should be increased. Not to mention an early solution to the issue of reunions of separated families, the Seoul government should also start a project to exchange visits to their hometowns and visits to graves of families who have already passed away. The government can also push for an inter-Korean project to visit the memorial altars of those who died in actions against Japan, in commemoration of the 100th anniversary of the March 1 Independence Movement. There is an ample possibility that the right scenario for 2019 may be “muddling through” like 2018, if there are no additional policy options, such as providing incentives for North Korea's denuclearization process. We should come up with policy means to elevate the muddling-through situation to “the stepwise advance” scenario. We have already made it clear that sanctions relief for North Korea will be possible when the complete denuclearization of the Korean Peninsula is irreversible. In this regard, our proposal divides the next two years into five stages and envisage a five-step denuclearization implementation plan (including corresponding measures). Overall, we propose that a package deal be signed at the second U.S.-North Korea summit. • North Korea-U.S. comprehensive agreement: Two-year process for FFVD (final, fully verified denuclearization) and security guarantee of North Korea and normalization of bilateral relations. - North Korea: disposal of nuclear materials and nuclear arsenal and destroy the means of carrying nuclear weapons. 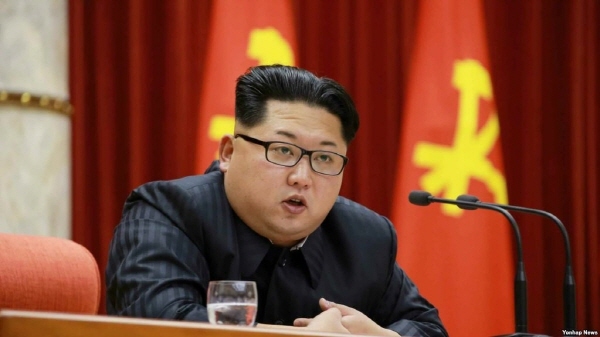 - The United States: adoption of the North Korea’s nuclear dismantling and the declaration of the end of the war immediately after the IAEA inspections, opening liaison offices between the U.S. and North Korea as second round of sanctions relief. - North Korea joins international military cooperation and arms control organizations such as CCW, MTCR, CWC, BWC, CTBT. ※ The United States: Declaration for non-use of nuclear weapons against North Korea and establishment of diplomatic relations with North Korea. Several inter-Korean cooperation measures have been proposed to prevent clashes between sanctions and inter-Korean relations, minimize differences between the two sides, and streamline the implementation of inter-Korean agreements. During the inter-Korean summit, the two Koreas have proposed to jointly develop a "Unipeace City" at the estuaries of the Han River and the Imjin River as part of a joint project to develop active human resources for North Korea. The idea of building a peace city includes a plan to develop the city into a "peace city" in 1989 as a unified Korean community after it was proposed in a speech at the U.N. General Assembly starting 1988. Location of the area to be developed marked in violate color. It is located opposite the Ganghwa Island on the west and the Parju City on the east--all located northwest of Seoul. 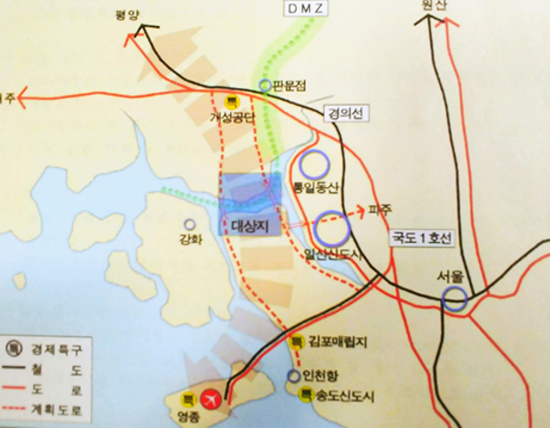 As part of the project to develop the Han River estuary, twin cities could be built in certain areas in both South and North Korea, alongside a bridge linking the two cities. The plan is similar to China's development of the Shenzhen region, and it is consistent with China's plan to build a new economic zone and a new economic map for the Korean Peninsula. The three major rivers of the Han River, the Imjin River and the Yeseong River meet to take advantage of the geological advantages that flow to the West Sea, so that the two Koreas can develop it into an international trade port when an era of peace and co-prosperity is opening. Addressing the North Korean nuclear issue is not an independent task limited to the nuclear issue. This is one of our undertakings, which is complexly linked to peace and prosperity on the Korean Peninsula. We can no longer remain as a mediator to resolve the North Korean nuclear issue. We must act as a person who persuades North Korea to solve the North Korean nuclear issue and also as a guarantor. To prepare for this, the Ministry of Unification could explore the ways to strengthen its policy-making capabilities, such as restoring the deputy prime minister's status.